Looking for a German Shepherd bag - make this unique dog lover gift a part of your own collection right now. This Ardleigh Elliott exclusive lets you take your beloved pup wherever you go! This German Shepherd handbag is crafted of the highest quality materials, featuring a large image of the German shepherd accented by real leather trim and handles. Handsome metal rings and feet add fashion flair and durability while the zipper top and front pocket open to lined compartments that hold all your belongings. This beautiful purse comes complete with a breed-specific sculpted metal dog charm on the front zipper to add a delightful tribute to your beloved breed of choice, the German Shepherd Dog. 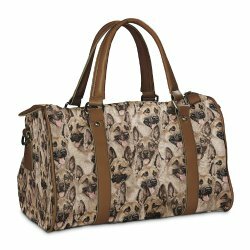 -This elegant dog lover's handbag is expertly crafted of luxurious cotton blend tapestry fabric featuring full-color images of your favorite dog breed, accented by real leather double handles and faux leather trim. Imported.